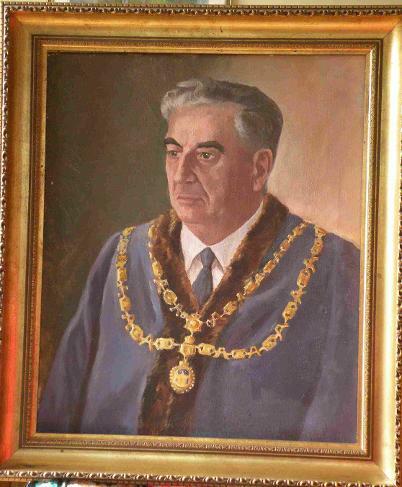 Left: This is an oil painting of Richard Arscott, who was chosen as Portreeve at the end of 1950. Painted circa 1955 by Jock McClennon (a student potter with Bernard Leach), the chain and robes were finished by Heather Jansch circa 1980. The robes that the Portreeve wears today are red, but formerly they were purple - the ones that Mr. Arscott wore can be seen in Ashburton Museum. Many thanks to Frances Berry for this item and the information on its history. 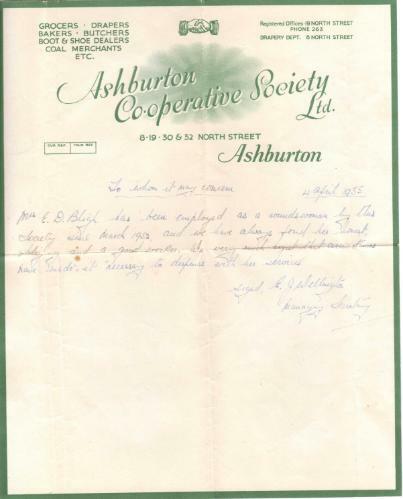 This is a reference for Mrs E D Bligh from the Ashburton Co-operative Society. 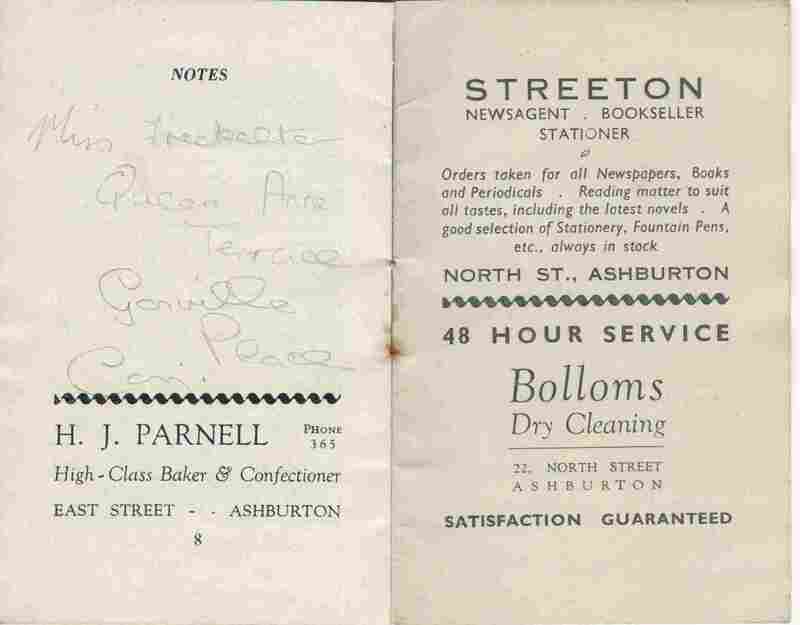 Dated April 1955, the Co-op at that time had departments at nos. 8,19, 30 and 32 North St. 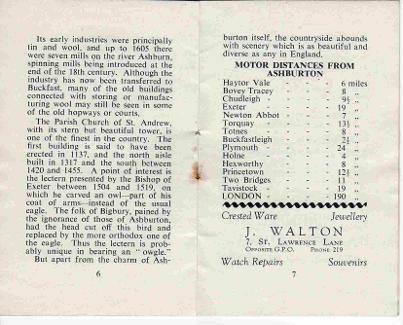 The drapery department was at no 8, and the regional office was at no 19. 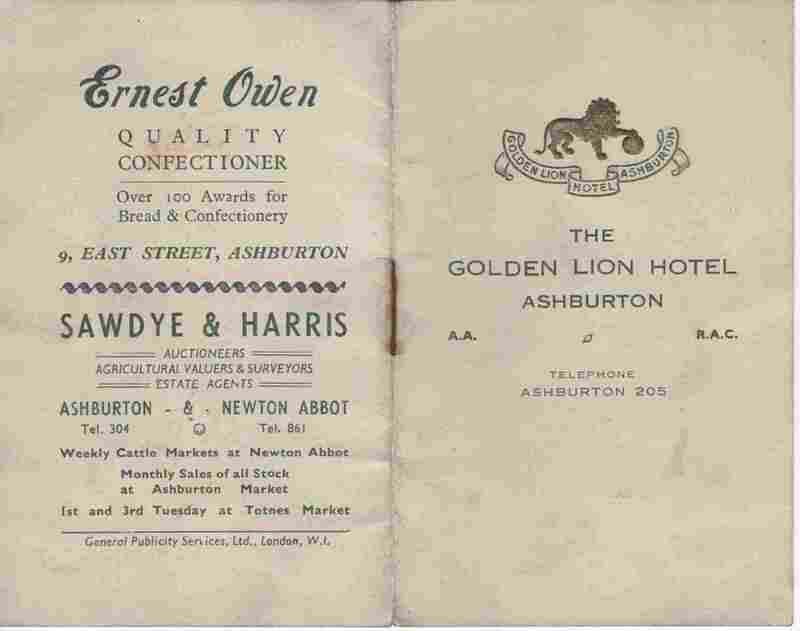 Above left: This is a sheet of plastic, 10cm long by 7½cm high, advertising goods made by Bakery and Confectionery Products Ltd.
Ernest Owen is shown as the proprietor of the company at 9 and 57 East St in the 1950s Official Guide to Ashburton - for more businesses see the 1900s sub-menu of the Banks and Businesses section. 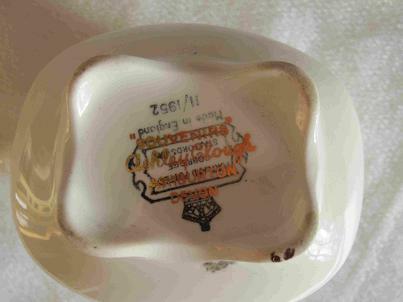 The object is a bit of a mystery, but was presumably given away to promote the company - could it have been used for bringing ingredients together on a surface, or maybe even for cutting dough, for example ? It does fit neatly in the hand. 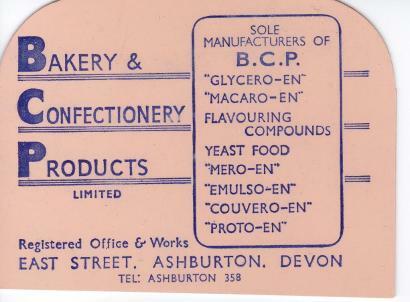 Whatever its use, the products shown reflect a time when the use of chemicals was seen as modern and progressive. A lock up garage could be had for 10/6 a week. 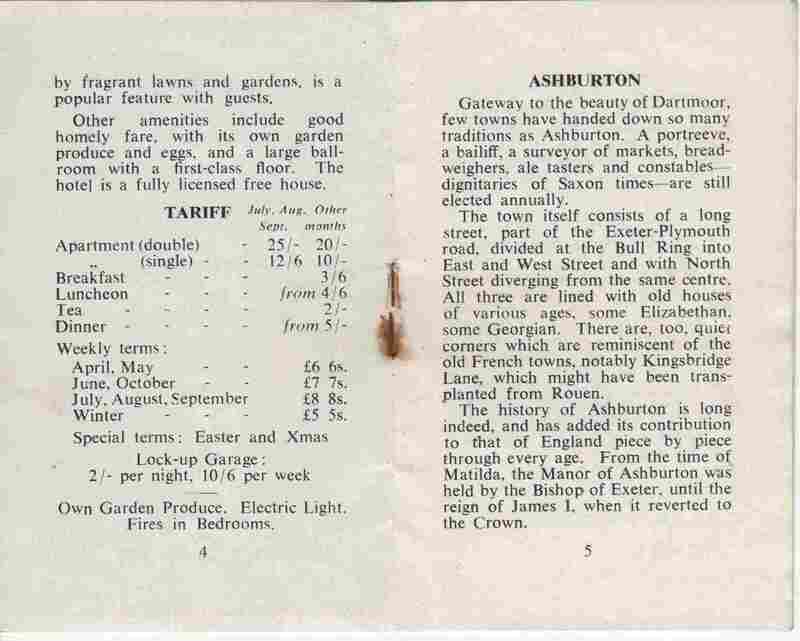 Attractions of the hotel included its own garden produce, electric light and fires in the bedrooms. 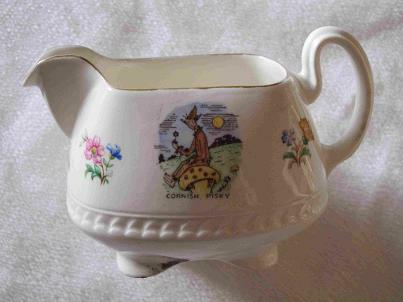 Above : A souvenir jug, this one of a Cornish Pisky, decorated by the Ashley Clough works. It measures approximately 10cm long by 5cm high. 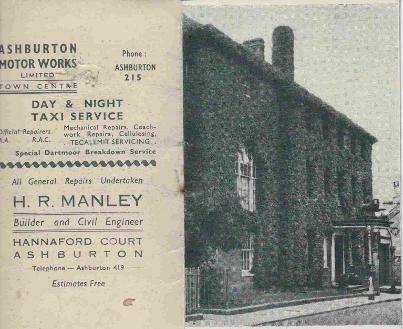 Wendy Major worked for Ashley Clough, in buildings that were situated in the stable block of Waverly Hall, on the right hand side of the drive. 'He had a brown bushy beard and brown eyes. He was a real gentleman. He came down from the Midlands, stayed in Ashburton about 5 years, and then moved to Buckfast. Then he came back to Ashburton. About 10 of us worked there, applying transfers and then hand painting on top before glazing. We mixed the paint from powder and turps. One particular girl put real gold onto the pottery, which she did with a roller. I was in charge when Mr Clough came to Ashburton for the second time. 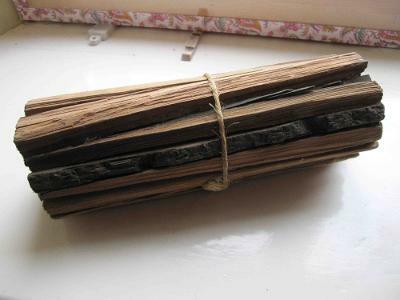 Above: A bundle of sticks made by Charles. 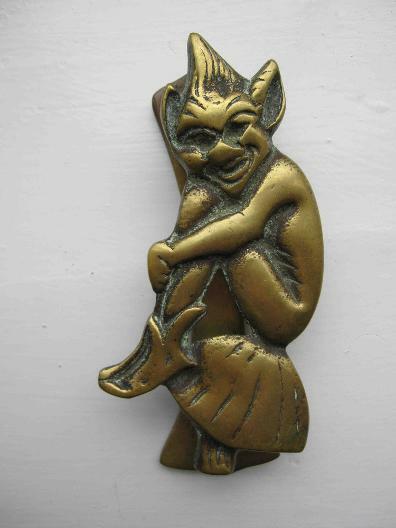 Many thanks to Wendy Major for the information opposite, and for allowing me to photograph the item above. The artist Richard Hext* had several brothers and sisters, including Charles, who was baptised on the 27th May 1908, the day after he was born. This suggests that he was not expected to live. * See Musicians, Poets and Artists, in the sub-menu to Famous Ashburtonians. He was also disabled - he had club feet, and in later life wore specially built up shoes. The two brothers had a car adapted to their needs, so that Charles could drive Richard around. Charles made his living by chopping up wood for lighting sticks and selling them in bundles - in the days when most people had coal fires, this would have provided a steady trade. On fine days he would often sit outside his cottage in North Street, cutting up scrap pieces of timber. Tombstone in St Andrew's churchyard. Right: The doorknocker that used to be at 5, Globe Arch. Globe Arch was roughly where Ashburn Close is now, close to the carpark.